Sew what's cooking with Joan! 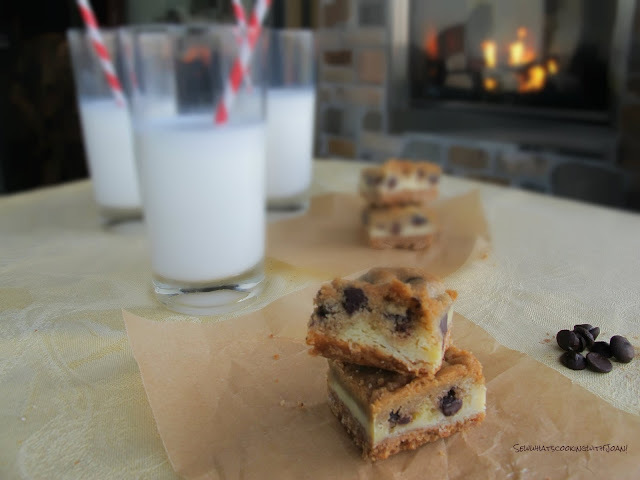 : Chocolate Chip Cookie Dough Cheesecake Bars! What happened to the lovely warm weather we have been having here in Seattle? I have spent most of the Summer in flip flops, shorts and capri's only to wake up this morning to a definite chill in the air. A fire in the fireplace, on the veranda chill! The good news in this is, we now have an excuse to turn on the oven and bake up something delectably good! 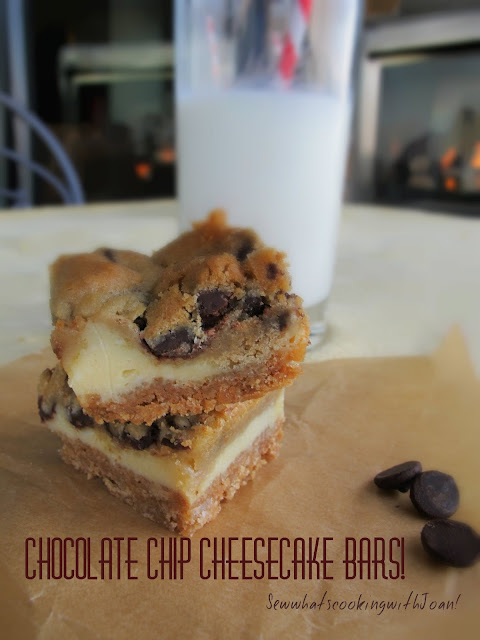 These chocolate chip cookie dough cheesecake bars are a mouthful.....of deliciousness! Just picture a bottom layer of graham cracker, a middle layer of creamy cheesecake, and a top layer of classic chocolate chip dough. Does this sound too good to be true? They are for real and are so easy to make! You are only a few steps to reality!! Spray an 8x8 baking dish with non-stick cooking spray. Mix the melted butter, 1/4 cup sugar, and the graham cracker crumbs to create crust. Press the graham cracker mixture into the baking dish to form the crust. Bake the crust for about 5 minutes, then set aside to cool. In a medium mixing bowl, mix cream cheese, and sugar until smooth. Once cream cheese and sugar are mixed, slowly mix in the egg and vanilla, just until blended. Pour the cheesecake mixture onto the already baked crust. 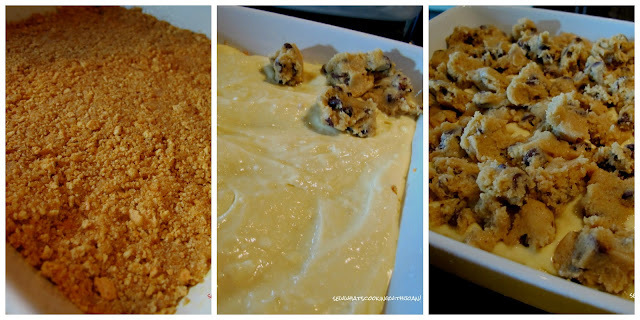 Then crumble the cookie dough and drop onto cheesecake filling. Like I said before these are easy to make and would make a delicious addition to the upcoming holiday weekend. Fire up the oven and have a baking day! These along with JJ's Ooey Gooey chocolate brownies, Secret Agent Huckleberry bars,JJ's Peach and huckleberry crisp, Tink's Chocolate Chip cookies, Peanut Butter Bacon cookies and/or Sweet One's Samoa's would complete your barbeque, picnic or get together with family and friends! Friday I will be sharing some ideas to round out your holiday barbeque, all found right here on Sew what's Cooking with Joan! We have a fun and action packed weekend planned with family and friends! I can hardly wait! Don't forget to visit my Facebook page and "Like" to follow, if you haven't already! Sew What's Cooking with Joan Facebook! Couldn't resist sharing this taken from our veranda last night! 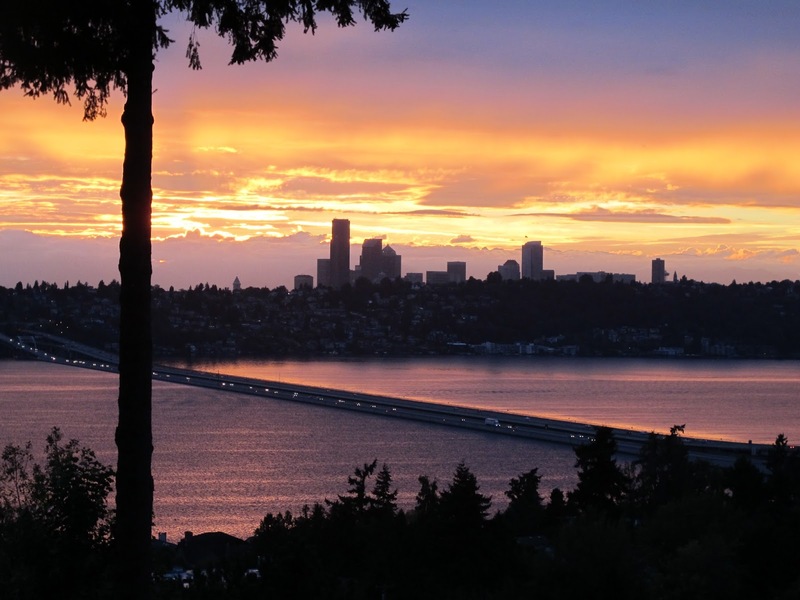 Beautiful Seattle! wow. I totally bookmarked this so I can make. Looks divine, thanks for sharing! Yum!! I'm so excited to try these. Thanks for sharing!